My friend, Leo Babauta, of Zen Habits and his gang (Collis and Cyan Ta’eed of FreelanceSwitch and FlashDen) are teaming up for a good cause. They are holding Blog Action Day. 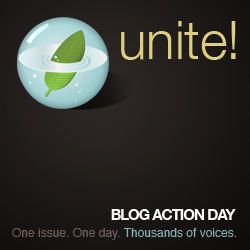 A day on which participating bloggers write about the same subject — on October 15th. The topic for this year is environment. This is a great idea, indeed. And so have many other bloggers. Such as Lifehacker, Web Worker Daily, Lifehack.org, Dumb Little Man, ProBlogger, FreelanceSwitch, Get Rich Slowly, Copyblogger, The Simple Dollar, Scott Young, Chris Garrett, Unclutterer, Wise Bread, Life Learning Today, Natural Family Living, Chief Family Officer, A Mama’s Rant, and many more. For the latest list of participants, click here. And I urge you to follow suit by signing up. A little effort makes a big difference. That’s the power of teamwork and it’s your opportunity to give back.